Assistant coach Tom Matukewicz will be at the helm when the Huskies the take on Fresno State in the uDrove Humanitarian Bowl on Saturday, December 18. Assistant coach Tom Matukewicz will serve as interim head football coach for Northern Illinois University as the Huskies prepare to take on Fresno State in the uDrove Humanitarian Bowl on Saturday, Dec. 18, NIU Associate Vice President and Director of Athletics Jeff Compher announced Tuesday. Former NIU head coach Jerry Kill was introduced as the University of Minnesota’s new coach on Monday and begins his duties with the Gophers immediately. 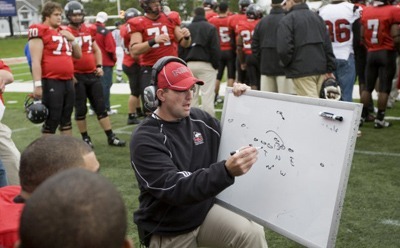 Matukewicz, who will also continue to coach the NIU linebackers while serving as head coach, is a former Football Championship Subdivision (FCS) Assistant Coach of the Year (2007). His duties at Northern Illinois have included several administrative functions as well as coordinating the Huskies’ run defense. Northern Illinois enters the bowl game, its school-record third straight bowl appearance, first in the Mid-American Conference and tied for 16th in the country in scoring defense; the Huskies have led the MAC in total defense in each of the last two seasons and were also the league’s No. 1 scoring defense in 2008. “Coach Tuke” will lead a staff that will include at least 10 current members of the Huskies’ 2010 coaching staff and every position coach. Led by Matukewicz, the staff will work together as usual to run practices, game plan and prepare an NIU team looking to win its school-record 11th game of the season after putting together an undefeated (8-0) Mid-American Conference campaign and achieving a Top 25 ranking this November. After falling to Miami (Ohio) on a last-minute touchdown in the MAC Championship game last Friday night in Detroit, Northern Illinois players have been preparing for final exams, which began Monday and continue through the week. NIU is scheduled to hold its first pre-bowl practice Thursday and the Huskies will depart for Boise next Tuesday, Dec. 14. Tickets for the 2010 uDrove Humanitarian Bowl game can be purchased for $25 through the Bowl Central page on Northern Illinois Athletics’ website at www.NIUHuskies.com, or by calling the NIU Athletics Ticket Office at 815-752-6800 during regular business hours. Northern Illinois will offer free tickets to NIU students who can attend the game. Students can pick up their free ticket (one per student) at the NIU Convocation Center Ticket Office beginning Thursday, Dec. 9. Proper identification will be required. Fans who cannot attend the game but wish to purchase tickets through Northern Illinois for $25 which will then be donated to personnel at the local Air Force base near Boise, can do so by calling 815-752-6800 or online through the PDF form.